Entire families came by bike to the food truck festival. 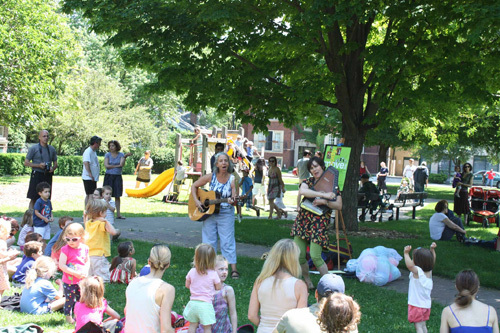 Usually empty, this lawn in Grey Park was transformed into a great community destination. Evanston’s Grey Park is like so many under-performing public spaces: beautiful but avoided because the presence of one group (in this case, the residents of Albany Care, an intermediate care facility for people recovering from chronic mental illness) dominates the park and there aren’t enough other positive activities to attract other groups. The playground is often empty, and despite being surrounded by many destinations neighbors frequent daily, this beautiful space is feared. The Trib says Grey Park is host to “a turf war between mentally ill patients and parents who live nearby.”So, what can be done to turn this park into an active, safe, inclusive destination? People of all ages like food trucks! Flirty Cupcakes sold out within hours. Big problems don’t always need big solutions. The answer may be as simple as cupcakes and empanadas. 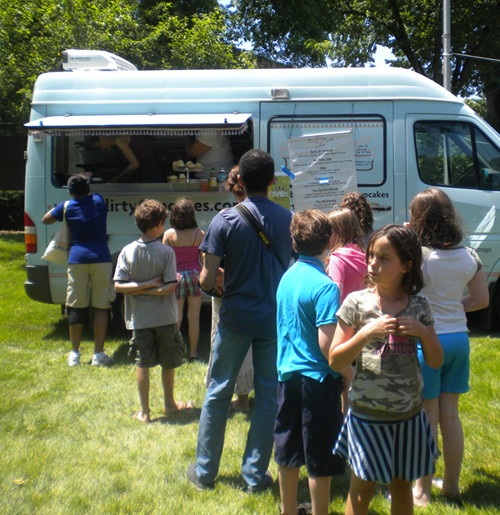 The community-led Evanston Parks Coalition (EPC) organized a food truck festival to raise money so that PPS could help lead a community-based visioning process. But the fundraiser did far more than just move them toward that goal: it changed the community’s perception of the space by transforming it into a great destination that brought hundreds of neighbors out to enjoy a park they usually just hurry past—all without costly, permanent infrastructure changes. It’s a great “lighter, quicker, cheaper” way to test out longer-term changes to the park. The EPC is led by a few “zealous nuts” (our highest praise for a local, dedicated Placemaking leader). Belén is chief among them and she is committed to a vision of a park with “features and activities that are common, that everyone—children, the mentally ill, parents, professionals, etc.—can enjoy.” Right along with her organizing the event were volunteers from The Center for Independent Futures, a non-profit for people with disabilities, and some residents from Albany Care. Belén says “we are big believers in the power of food” to create common ground. Belén said many people who attended the festival asked, “Why don’t we do this every week?” Many of the vendors recruited for the day quickly sold out and the park was packed with families from the neighborhood. But it wasn’t just about the food: the festival also featured bands, a Spanish/English sing along, and a zumba class—all of which neighbors donated. 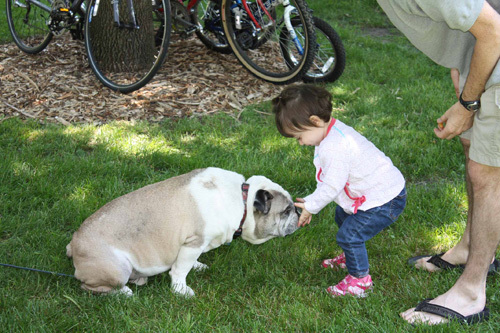 Dogs and kids played together during the festival. 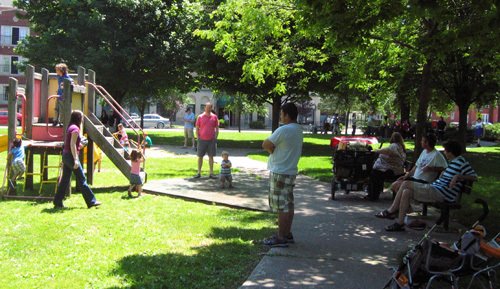 The park has a lot of potential to become a great neighborhood gathering place. It has what PPS calls “good bones:” it’s large, green, and surrounded by a number of important destinations that people visit every day. Grey Park is right on an important north-south road that’s a main artery for the town and is at the entrance to the business district. Two blocks away are an L and Metra stops, a major transportation hub, and then there are four schools (an elementary school, middle school, catholic school and school for children with disabilities). Charles Grey, who gave the park, bought the land at that location because of its proximity to the schools and downtown. The park's playground on a typical day. Neighbors say it's usually a “de facto smoking area” with no kids. The same park during the festival is packed with families enjoying the playground. Next steps Already there are plans in the work for another Food Truck Festival next year. Organizers say they’re thinking of expanding the festival by stationing food trucks in different parks throughout Evanston. Belén also wants to put out bike rentals so people could bike around Evanston.When used strategically, putting out affordable, good food can actually create an inclusive, comfortable setting that welcomes many different kinds of people. 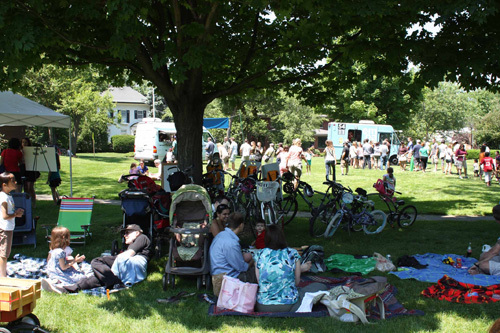 Evanston shows how food trucks can be a "lighter, quicker, cheaper" strategy to transform a maligned, deserted park into a hub of neighborhood activity that sets the stage for future changes, local investment, and even new friendships. Show Solutions: Big problems don’t necessarily need big solutions. Redesign is often thought of as tearing up the park and adding lots of new features. In our case, the park is beautiful. Some programming and some key new features will go a long way. Triangulate: Blur the line between playground and kiosk. We wanted to show that it is very easy to supervise children playing as a collective of adults. If all the adults are eating or picnicking, children will just play together in close watch. And children don’t need playgrounds! (Playgrounds are expensive!). Observe where people picnic: They’ll choose promising parts of the park! Picnics are a great way to find out the most desirable spots. People will put their blankets down in promising parts of the park. Surprisingly, people laid blankets in close proximity to the tables where the mentally ill always sit––the infamous tables at the heart of the controversy! People won’t set up camp if they feel uneasy. Schedule events throughout the park to test the performance of various existing features. We learned a lot about our amphitheater by observing the way people used it. We had planned to do daytime performances there but it turns out it was way too sunny (even though it was a cool day). Lesson learned: No performances at lunch time, unless there is a tarp. Upside: We discovered the amphitheater would make a great space for water shoots for kids. Adults could sunbathe and children waddle. In the evening, when the water is off, performers could set up shop. Park Trucks Strategically: Experiment with Traffic Calming. People generally perceive most of the space in Grey Park as unusable because it is at the intersection of two main streets. We purposely put the trucks close to the busiest streets, to show that the park is so big that the traffic is actually quite far away. It is safe to use those parts of the park, even for children. Think Like A Truck. Food trucks have followers on Twitter. Use their social networks to attract large numbers of unprejudiced users to your park. Also make sure your trucks get there early. Otherwise you will have permanent lines. Remember, truck foodies arrive ahead of time!